Time-to-contact is the visual information that observers use in fundamental tasks such as landing an airplane or hitting a ball. 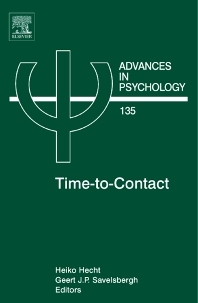 Time-to-contact has been a hot topic in perception and action for many years and although many articles have been published on this topic, a comprehensive overview or assessment of the theory does not yet exist. This book fills an important gap and will have appeal to the perception and action community. The book is divided into four sections. Section one covers the foundation of time-to-contact, Section two covers different behavioral approaches to time-to-contact estimation, Section three focuses on time-to-contact as perception and strategy, and Section four covers time-to-contact and action regulation. Psychologists, physiologists, biologists, and physicists interested in perception and action.